Had the pleasure of making a cake for my friend's daughter's first birthday party. 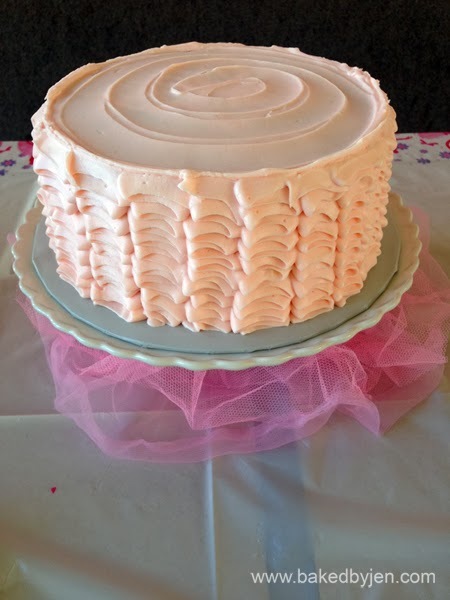 It was a ballerina themed party; so, this pink buttercream ruffle cake fit right in. 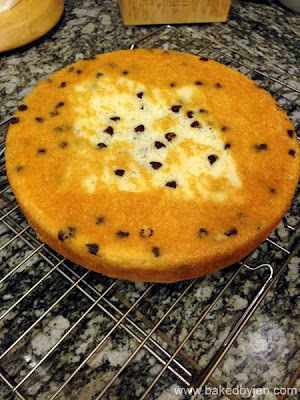 The cake was kept fairly simple given I also made 2 dozen cupcakes, carrot and white cake with chocolate chips, as well as the smash cake for the birthday girl. I am becoming quite a fan of this design; given this is my second attempt at a buttercream ruffle cake now. As I mentioned before, it helps a lot to score vertical lines around the cake to keep your columns of ruffles uniformed. I can't believe I haven't used my mini bundt pans from last Christmas until today. I finally put them to use for a quick birthday treat for two of the husband's coworkers. 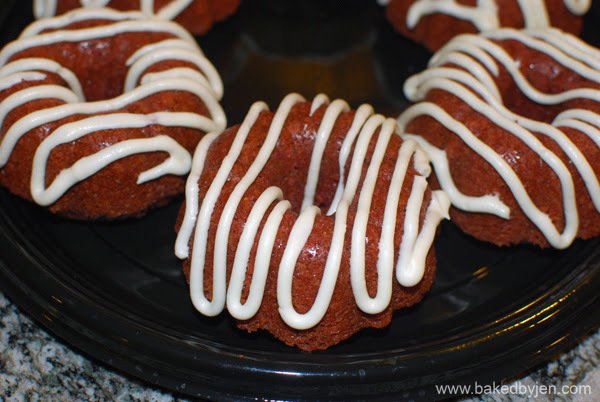 I always thought that bundt cakes had to be dense; however, I used my go to red velvet recipe and it not only held up well but it came out of the pan perfectly. Can't wait for another excuse to use my mini bundt pans. 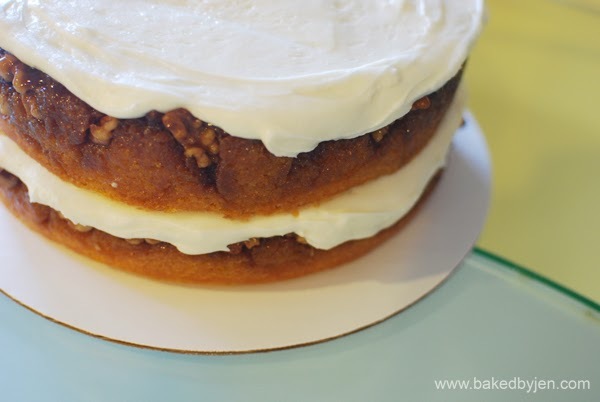 After much success with my first upside down cake, I knew I wanted to make this Praline Pecan Pumpkin cake when I saw it on Pinterest. Because I didn't have any pecans on hand, I subbed in walnuts. I recommend sticking with the pecans. The cake was fairly simply to make the day of, for a dinner party with friends. Like the upside down cake, it started out with brown sugar and butter melting in a pan over the stovetop. The mixture was poured into the bottom of the cake pans along with the walnuts. The reason why I thought the walnuts didn't work here was because it lacked the nuttier taste. If I toasted them before tossing them into the bottom of the cake pans, it might have worked. 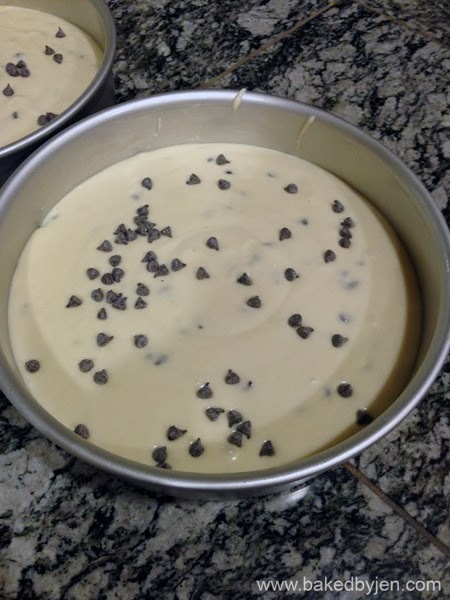 Because I was keeping the cake simple, I added two layers of cream cheese frosting instead of frosting the cake completely. Next time, a drizzle of caramel sauce over the top would do wonders.